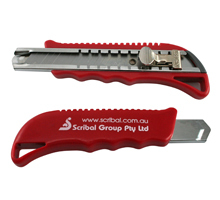 Practical and functional box cutting knife regularly used by all trades people, home handymen, hobbyists, warehouse and dispatching staff. Blade slides back into scabbard when not in use. Snap-off replaceable blades can be purchased in most hardware shops.